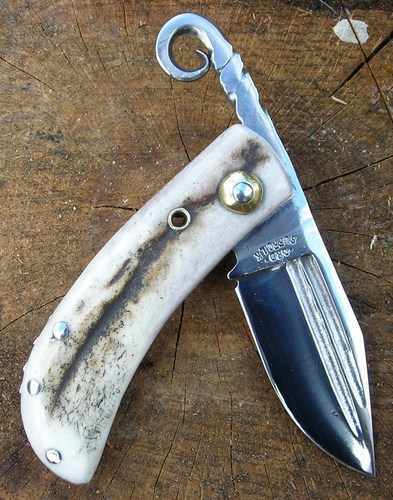 This knife has a handforged 'silver steel'blade with a double fuller on one side and plain polished steel on the other. It has a general use grind with the edge bevels on the very edge of the blade for rapid sharpening. The double fuller serves the purpose of a nail nick, to open the knife, but offers a better grip on the blade. 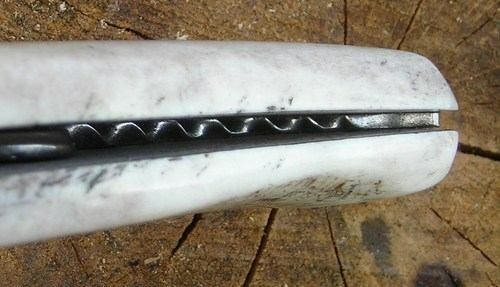 The handle is made using two thick slices of Red Deer Antler riveted together using steel pins with a twisted spine, also of silver steel between the two bone sides. The twist in the spine adds feature inside and outside the handle.